Come with your child and experience a little of our Rose Kindergarten while we do a seasonal activity. Our teachers and admissions staff will be available for questions and conversations. Kimberton Waldorf School offers one of the area’s only full-day, mixed-age kindergarten programs, serving children ages 4 to 6 years old. Our kindergarten programs are carefully designed to respond to the developmental needs of the young child through creative, play-based learning. 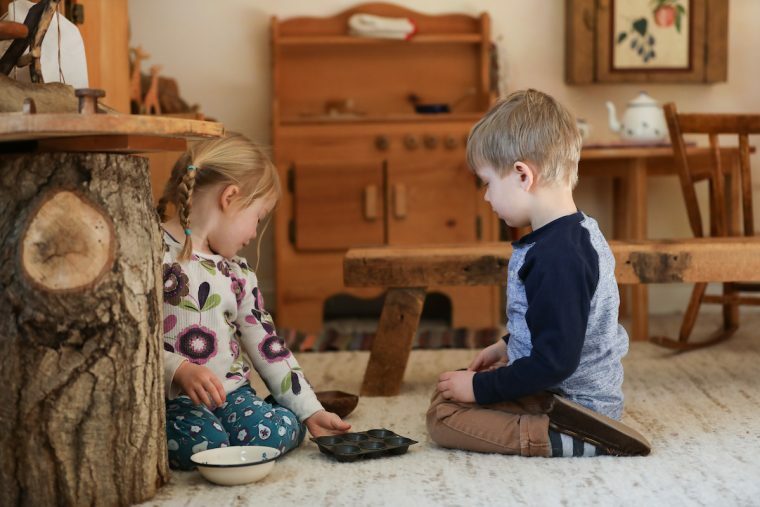 The teachers work closely with parents, and in this way, form a bridge for the child between home and school from the earliest years, creating a sense of security and trust. The kindergarten program provides a warm, nurturing foundation for young children, and allows unhurried time for their growth. Cognitive, social, emotional, and physical skills are accorded equal value in our kindergarten program. The teacher creates an inviting, carefully structured environment with a strong daily rhythm to engage the child. Through attentive observation and calm, loving presence, the teacher guides the individual child and helps to create an active, healthy classroom community where each child can thrive. The program is designed to foster both personal and social growth, as well as meet the changing needs of the child as they mature. The use of storytelling, poetry, and recitation provide a strong foundation for emerging literacy, as these activities expose the children to the building blocks of reading. While there are many teacher-directed activities, much of the day is devoted to free play, which is essential for healthy development.